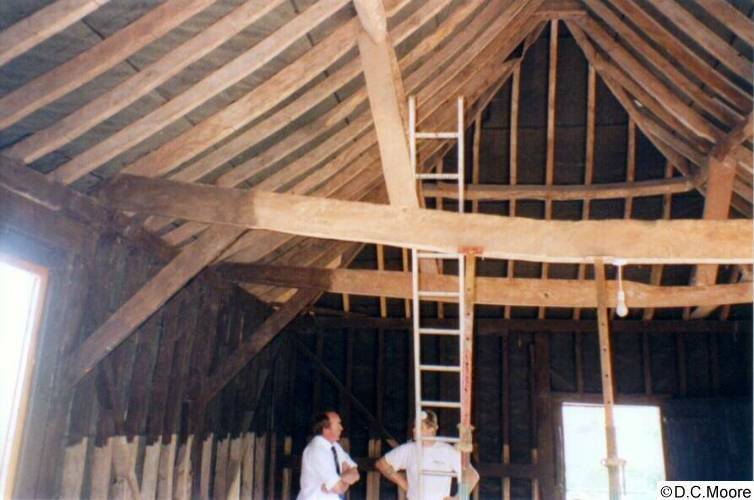 Timber Beams that have partly broken or been eaten by Rot or Wood Boring Insects can be repaired using High Tensile Steel Bars, Zinc Plated Allthread, or Epoxy-Glass Bars or Stainless Steel Bars. 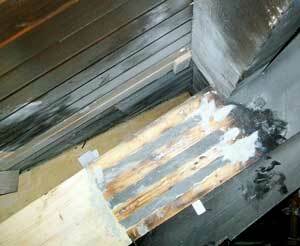 The bars are then embedded in Structural Epoxy Pouring Resin or Grout. Upgrade the Beam or Joist - cut a slot, or slots, along the length to within about 40mm of the base and bond in BS4449 High Tensile Rebar with Structural Epoxy Pouring Grout. This is know as a 'modified flitch' design and approximately doubles the stiffness of a typical timber, in bend. 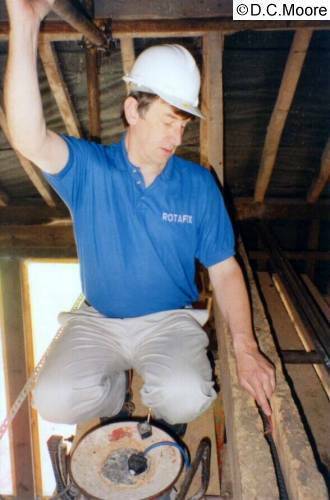 Barn, Somerset - overloaded tie beams in a barn now carrying heavy clay tiles on the roof (had been a thatched roof and then was converted to a lightweight galvanised sheet roof). Loft Conversion, Newton Abbot - maximum ridge board to be 12" x 4" (300mm x 100mm), not strong enough to meet Engineers specification. 1. Cut off the end completely and fit a Timber-Resin Splice, priced and manufactured to fit the exact size and timber type. 2. 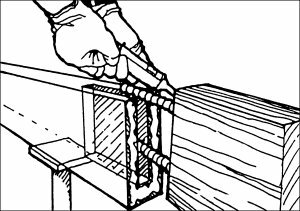 Build a box around the missing part, fit Rebars to extend into the sound part and fill with Structural Epoxy Pouring Grout. 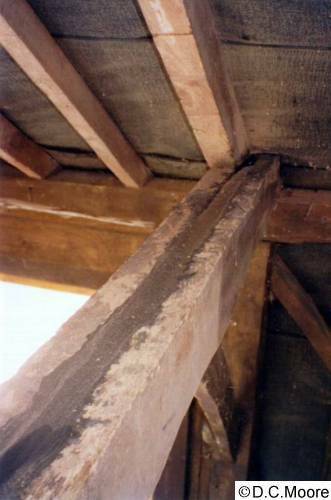 Bindon House Hotel, Somerset - truss ends and tie beams, Dry and Wet Rot. 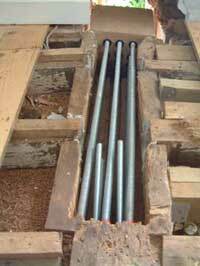 The ends were replaced using TYPE E Timber-Resin Splice units, made to measure . 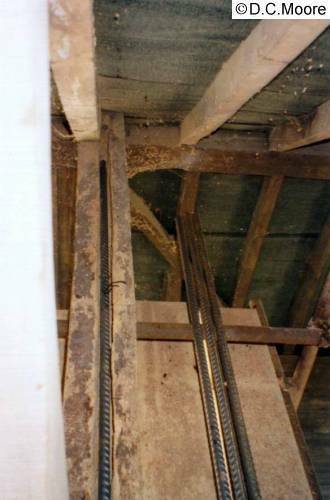 Timber-Resin Splices and bars in place. 3. Treat vulnerable timbers with Boron Products - Boron Rods, Boron Paste, Boron Gel and Ultra 12 powder in water, by spray or brush for indoor use, to floor and roof timbers. 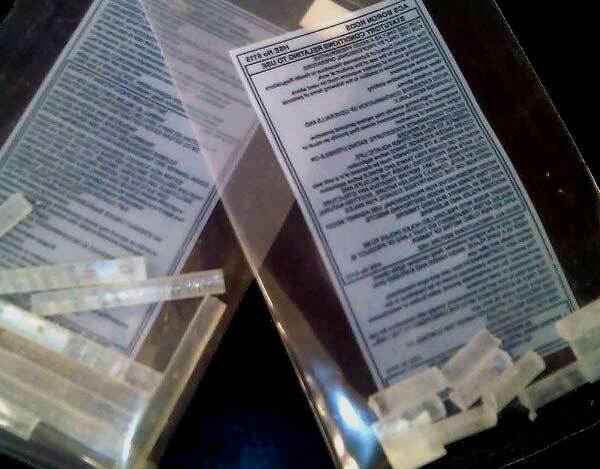 Boron Rods in packets of 10. Drilling a Pole for preservation.